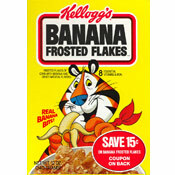 According to an ad when the cereal was introduced, "Kellogg's Banana Frost Flakes delivers real bits of banana and great banana taste in every bite." The bits of banana were adhered to the the flakes as nut pieces are in certain other cereals. 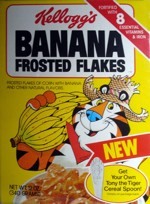 The initial box featured Tony The Tiger in a straw beach hat with a bundle of bananas over his shoulder. 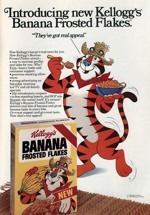 On the back of one box, Tony The Tiger is quoted as saying, "My new Kellogg's Banana Frosted Flakes have real appeal!" What do you think of Banana Frosted Flakes? View all 35 comments for this cereal. I bought a box of the new Frosted Flakes Banana Creme flavor, hoping that it would be the same or a similar recipe. Unfortunately, it isn't: there are no banana bits, it's just banana flavoring in the sugar glaze. Banana Frosted Flakes have been the number one cereal I have wanted a revival of since I was a little kid. 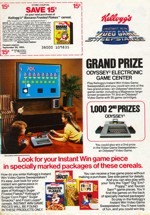 I LOVED this cereal. I was 9 years old when it came out. I still remember that commercial too like it was yesterday. I wish they still had this on the market. 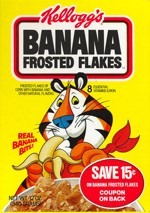 Please bring back Banana Frosted Flakes! The BEST ever! Glad to see I'm not alone in that opinion. Can someone send me some PLEASE! Please, PLEASE bring them back! I LOVED them. They really were Grrrr... eat! I had found a version of this while living in Panama in the early 2000's. Zucaritas con Manzana. Pretty tasty stuff. The Zucaritas subsection on the Kellogg's site doesn't currently list it, so not sure if even that now exists. I love banana cereals and want to try this one really bad, but I can't find it anywhere! :( I did see chocolate flakes though and they look good! It had achieved certain fame in Brazil and has lasted far more than the American counterpart. It definitely tasted like banana-flavoured bubble gum but we sure liked it.